At the end of last year a constitutional crisis arose in austerity-ridden Greece with the failure to elect a president. This triggered an early general election to be called for 25 January. Much to the panic of the capitalist class internationally, Syriza (the left party) leads the polls, largely because it is seen as the best chance of hitting back against austerity. Why are elections taking place? The given reason is because of the presidential elections. The president in Greece is elected by a 60% majority in Parliament. There is a clause in the constitution that if the Parliament cannot vote for a president then there has to be a general election and then the president is elected by 50% of parliament. The government could not get the two thirds majority. Beyond this however, the essential reason is that the policies of the government have come up against a brick wall. Society is rejecting these policies and that was translated into parliament where Pasok (the traditional ex-social democratic party) and New Democracy (right-wing capitalist party) have lost a big section of their MPs. These MPs are now independent and didn’t vote with the government. Also, the government parties could not split the smaller Democratic Left and Independent Greeks parties, despite their intense attempts to do so. Thus they could not gather the 60% majority they needed to vote for a new president and stay in power untli 2016 when the present government’s term ends. What is the likely outcome of the election? Most likely is a Syriza victory. There is a big campaign of fear by the capitalist class, both in Greece and internationally, to try and prevent this. It’s the usual campaign that we expected, claiming that if Syriza is elected then Greece will be out of the Euro and that would be an absolute nightmare and all hell will break loose, etc. The Prime Minister said yesterday that if Syriza wins, then Greece will become like North Korea – so this is a fear campaign reaching ridiculous levels. But it’s not having the same effect on the population as it did in 2012. People are now angry enough to vote for Syriza despite the fear campaign. There are already signs that the establishment is quite panicked about the outcome of these elections – particularly New Democracy. But it’s not clear cut. Papandreou (the previous prime minister and ex leader of PASOK) is creating a split in Pasok and forming a new party. This is presenting itself as a left wing split – accusing the leadership of Pasok of abandoning the party’s socialist principles. That’s despite the fact that Papandreou was the prime minister who put the Troika into Greece and Greece into the memorandum. But it’s unclear how much support this new party could receive. The problem is that Syriza’s lead on New Democracy is only around 3-4% in polls. Although the most probable development is a victory for Syriza, it’s a question of how big a victory it will be and whether it will be able to have a majority government or a minority one which has to depend on the votes the Democratic Left (if elected) the Independent Greeks or Papandreou’s new party, all of which are actually forces of the establishment. How do you think Syriza will act in government? In some ways Syriza’s leadership would prefer to win without an overall majority so that it can blame relying on the votes of others for having to pursue less radical policies. This would be an excuse. The Syriza leadership has been moving clearly to the right since the elections of 2012. 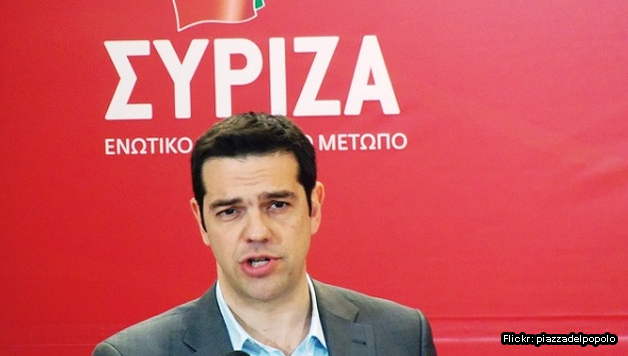 In the rest of Europe, Syriza is presented as a very left, radical, even far-left party. But in Greece there is great suspicion and lack of enthusiasm in the masses because they see that the leadership of Syriza is doing everything possible to come to an understanding with the forces of the market – the Troika, the EU, and the national establishment. It’s not ruled out that Syriza could move further to the right to stay within the Eurozone once in power. But things will not be black and white in the next period in Greece, because we shall also have the interventions of the mass movements. The problems in society are so major, millions of people are in an absolutely desperate situation. They will have to fight, and they will fight, pushing a Syriza government to the left. So, despite the fact that the Syriza leadership is moving to the right and looking for a compromise with the forces of the markets internationally, it is possible that they will be pushed to the left under the pressure of the mass movement. How does Xekinima think the campaign of fear about the Euro etc should be answered? We think that it’s impossible to have a pro-working class programme – to abandon the memoranda, to get out of the present crisis of the economy by using the public sector as a steam engine for the economy to grow and in general to say no to the neoliberal policies of the EU – and at the same time to stay within the Eurozone as it is today. There are only two possibilities. One is that there will be a mass, internationalist appeal by radicalised forces of the working class and the government of the Left in Greece to the working classes of Europe and to the developing left forces of Europe to fight for major changes in a socialist direction across the continent. If this does not take place (being put in check by the SYRIZA leadership) or doesn’t have sufficient time to develop, then the country will be outside of the Eurozone. A return to a national currency, however would not necessarily be a disaster – if it is accompanied by socialist policies in Greece by a government of the left. Under a left government using a national currency and applying socialist policies, based on nationalisations, the planning of the economy and workers’ control and management, the economy could quickly take off. In these conditions the internationalist appeal would have to continue, aiming at bringing forward major socialist change across Europe. We believe that this approach has to be put openly to the Greek working class to prepare it for the battles that are looming ahead. Unfortunately the leadership of Syriza is not doing either of the two and it just creates an artificial optimism – “don’t worry, nothing will happen, we guarantee that the country will stay in the Eurozone”. This is a major mistake. How should the struggle be organised under a Syriza government? There has to be a very conscious attempt at coordinating the struggles because no isolated struggle can win in the present context. These struggles must try to link with the left rank and file of Syriza to push the party to the left. They have to attempt to create democratic structures within society and within the movements so that the rank and file has the decisive say. To get rid of the Troika and the present government, these struggles should be in the hands of the whole of the left, a united left. Unfortunately the left is split. Part of the blame for this is that the leadership of Syriza does not try to genuinely build a united front. But society and the working class will move in the great masses to vote for Syriza. Xekinima is part of this movement. As part of the “Initiative of 1,000” we’re calling for a vote for Syriza, we’re in negotiations with Syriza to have a number of candidates in some of the main constituencies in Athens, Salonika and Volos. The final factor is that the struggles must aim for a socialist programme – nationalise the banks, nationalise the commanding heights of the economy, plan the economy. All of this has to be under democratic control and management by the workers, otherwise we shall have the corruption that we had in the state sector in the past. On this basis struggles can be victorious and can provide huge inspiration to the working masses in the rest of Europe.